Monday, 18th Feb at 8.00pm. In the century following the dissolution of the monasteries it became obvious that society needed a replacement for the hospices and hospitals which the religious had run. The Elizabethans solved the problem in a series of Acts which made every parish responsible for its own poor. By the end of the 18th century this system was no longer fit for purpose, and was replaced in 1834 by a much more draconian regime. 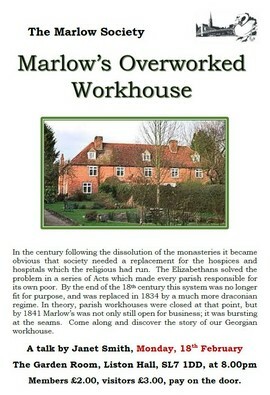 In theory, parish workhouses were closed at that point, but by 1841 Marlow's was not only still open for business; it was bursting at the seams. Come along and discover the story of our Georgian workhouse. Members £2.00, Visitors £3.00, pay on the door.